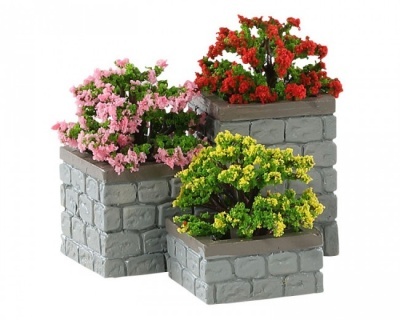 Lemax Flower Bed Boxes Accessory Set of 3 depicts a group of stone effect planters with colourful flower arrangements in miniature. A new Lemax accessory which joined the Lemax Village collection in 2018. Three Flower Bed Boxes constructed in wonderful miniature scale in plastic to compliment your seasonal Lemax Village display.